The Building Resilience and Adaptation to Climate Extremes and Disasters (BRACED) programme, launched in 2014 and funded by DFID, responds to the most immediate impacts of climate change – extreme climate events such as droughts, floods and cyclones. This paper (download available in right-hand column and via the link at the bottom of this page) presents an explanatory framework for measuring resilient outcomes that embraces and makes sense of the current diversity in resilience approaches. 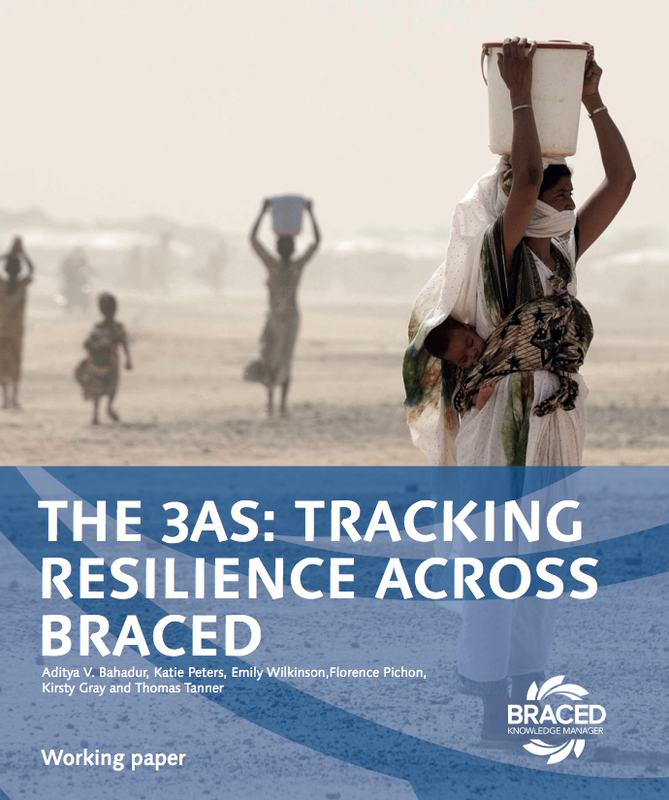 Here, outcomes from BRACED projects are understood to be a set of interrelated resilience capacities – the capacity to adapt to, anticipate and absorb climate extremes and disasters (the 3As). The 3As framework can organise practical actions or processes for resilience building and offers a new and innovative means for doing this. In acknowledgment of the growing discourse on ‘transformation’, this paper also presents a workable approach to analysing the potentially transformative impact of BRACED interventions. Resilience can be broken down into three readily recognisable capacities of adaptation, anticipation and absorption (definitions given below). 'Transformation’ is a not a capacity but rather an approach to holistically and fundamentally build, reshape and enhance people’s capacity to adapt to, anticipate and absorb shocks and stresses. The 3As and transformation concepts described provide a useful starting point for understanding and measuring changes in the resilience of social systems, from households and communities to states and markets. By focusing on the capacities of these systems and processes, we can understand how best to enhance resilience through tracking and measurement. Resilience can thus be measured without the need for a disaster to occur to demonstrate where it is lacking. The explanatory power of this framework can be used as an approach to guide the design and execution of resilience programmes. Using this analytical lens at the formative stages of an operational initiative could ensure a broader range of interventions are considered, and hedges against the risk of resilience programmes focusing only on one capacity and overlooking another that may also be needed in that particular context. The 3As should not be seen as a directive or graduated scale of priorities that need to be addressed. Having adaptive capacity is not necessarily better than having absorptive capacity. It is thus vital to undertake an in-depth analysis of the context and consider which capacities (spanning the 3As) a community needs and how to enhance these in a transformative way. There are obvious synergies between these capacities, and building one capacity can often support the building of another. Different actors and initiatives will interpret the 3As in accordance with their own Theories of Change and priorities, and probably develop very different sets of indicators for each capacity. It is only through this application that the concept will be sharpened over time and validated as a useful approach to tracking the outcomes of resilience-building processes. Within BRACED, resilience is understood to be the ‘ability to anticipate, avoid, plan for, cope with, recover from and adapt to shocks and stresses’. This report (download in right-hand column) explores each of the three capacities of resilience: adaptive, anticipatory and absorptive, with an additional section on transformation. In the report the conceptual foundations of these three capacities are considered and a practical grounding on each capacity provided drawing on examples from the 15 consortia that make up the BRACED programme. A discussion of how the BRACED portfolio of projects is planning to track changes in the 3As and transformational outcomes is also given. The following text provides an overview only. This includes the ability to take advantage of a disturbance, as well as learning from the legacy of recurring shocks and stresses in such a way as to reduce vulnerability to future events. As a key element of adaptive capacity is learning from disturbances (including by looking a historical patterns), communities with such capacity are able to recover in ways that reduce their vulnerability to the same shocks should they occur again, as well as to new and emerging risks (Smit et al., 2001). Key to our interpretation of adaptive capacity is the awareness of changing conditions, with communities thus also able to adopt new strategies to engage with evolving and unexpected shocks and stresses (Lopez-Marrero and Yarnal, 2010). Taken alone, adaptive capacity can be seen as ‘good development’: Actions to improve adaptive capacity, for example diversifying livelihoods in resource-dependent communities, aim to improve wellbeing regardless of whether climatic events will affect the beneficiaries in the near future (Huq and Reid, 2009). They make communities more resilient to disaster events, and, by increasing access to and use of basic services, for example, improve overall health, economic, social and institutional outcomes independently of climate-related ecological changes (Schipper and Pelling, 2006; Smit et al., 2000). Anticipatory capacity is seen in proactive action before a foreseen event to avoid upheaval, either by avoiding or reducing exposure or by minimising vulnerability to specific hazards (Kellett and Peters, 2014). Anticipatory capacity is displayed when communities are able to forecast particular shocks, for example through the use of cyclone early warning systems, and be ready to act on this information and undertake pre-emptive measures to reduce the impact of impending hazards (Fankhauser et al., 1999). An additional component of anticipatory capacity is the ability of communities to undertake vital planning and preparedness activities to manage disaster risk (Adger, 2003). Actions to strengthen anticipatory capacity tend to be hazard- focused, though some may also serve a secondary purpose, e.g. enhanced preparedness can be used to support existing community coordination initiatives (Fordham and Gupta, 2011). Absorptive capacity is the ability of social systems to absorb and cope with the impacts of climate variability and extremes, i.e. to use available skills and resources, to face and manage adverse conditions, emergencies or disasters (Hudner and Kurtz, 2002). While anticipatory capacity comes into play before a shock or stress, absorptive capacity is exercised during and after a disturbance (disaster) has occurred to reduce the immediate impact on people’s livelihoods and basic needs. It is the ability of a system to buffer, bear and endure the impacts of climate extremes in the short term and avoid collapse (death, debilitation and destruction of livelihoods) (Blaikie et al., 2003; Folke et al., 2010, Bene, 2012). For the purposes of tracking and measurement, absorptive capacity can be seen in the ability of communities to access and deploy tangible assets such as savings and intangible assets like social networks to help them survive intensive shocks and maintain levels of wellbeing (Levine et al., 2011). The extent to which absorptive capacity is present (and deployed) has implications for longer-term adaptation and transformation: if communities cannot endure the immediate aftermath of a disaster, they will be unable to sustain themselves or their livelihoods or to take advantage of any new opportunities that arise. Research on disaster recovery has highlighted the importance of accessing financial resources in the immediate aftermath of a disaster, as communities and states attempt to rebuild and maintain essential functions. In the absence of capital and facing a serious loss of resources, poor households are often forced to reduce their own consumption in order to avoid selling off productive assets to meet basic needs. This in turn can have devastating impacts on childhood nutrition and long-term household wellbeing (Becchetti and Castriota, 2011). As well as the provision of additional resources, ‘asset diversity’ is also understood to be key to resilience and enhances absorptive capacity (Carpenter et al., 2001; Folke, 2006; Holling, 1973; Resilience Alliance, 2009). in which people’s capacity to adapt to, anticipate and absorb shocks can be built, reshaped and enhanced. The capacity of social systems to adapt to, anticipate and absorb climate extremes and disasters can be influenced by transformational policy shifts that fundamentally change the institutional ‘rules of the game’ (Béné et al., 2012). Transformation can also be brought about by leadership and empowerment processes (Olsson et al., 2004). Leaders/Leadership can play a central role in transformation through recognising needs and opportunities and in effectively communicating a vision of change to others. This can challenge the status quo, provide alternate visions of what is possible, take advantage of ‘policy windows’ and manage conflicts that may emerge during transformational processes (Michaels et al., 2006). Transformation requires engagement with issues of power at two levels (Kapoor, 2007): changes in the social structures that influence decision-making (e.g. households, businesses, government departments) and changes in individual values, capabilities and choices. Many transformational changes therefore depend on altering existing power relations (eg. gender dynamics), which involves recognising the social and political processes that both undermine and constrain resilience. They also entail building greater transparency and the inclusion of marginalised groups into formal and informal governance systems, policies/regulations and decision-making spaces. Apart from leadership and empowerment, innovative technologies and processes can also transform systems. While ‘innovation’ can be applied to many contexts, there is an important distinction between approaches that strengthen the status quo and those that champion innovation with the potential for change (Pelling, 2010). Such innovation is likely to be disruptive and may destroy, at least in part, existing approaches to livelihoods, governance and business (and the associated skills) to enable transformation to occur (Francis et al., 2003). BRACED (Building Resilience and Adaptation to Climate Extremes and Disasters) aims to build the resilience of more than 5 million vulnerable people against climate extremes and disasters. It does so through a three year, UK Government funded programme, which supports 108 organisations, working in 15 consortiums, across 13 countries in East Africa, the Sahel and Southeast Asia. Uniquely, BRACED also has a Knowledge Manager consortium.